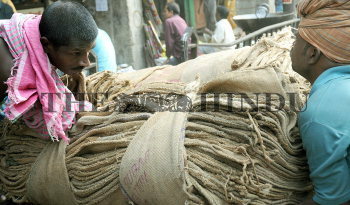 Caption : Kolkata: The daily wage labourer carrying the jute bags at a market in Kolkata. Central government has ruled out a blanket ban on plastic bags and said waste management at the local level should be improved to ensure that the waste did not become an environmental hazard. It was recalled that 20 years ago plastic bags were introduced to check deforestation. However, the jute industries are throbbing for a better market in the country itself. Photo: Arunangsu Roy Chowdhury May 05, 2010.